Benefits of dental implants – Your teeth should last throughout your lifetime, however we know this isn’t always the case. For many years man has endeavored to find an ideal replacement for natural teeth. Tooth loss is a problem as it causes difficulty with eating and normal chewing function. Missing teeth within the smile area can also have a significant effect on ones appearance and confidence. Removable Dentures, Dental Bridges and Dental Implants are all common alternatives for missing teeth but what is the real difference between each of them. Also known as false teeth, dentures are removable and are one of oldest forms of tooth replacement available to man. According to Wikipedia,the first dentures were found about 700 BC. There are different types of dentures, full complete dentures are supported only by gum tissues while partial dentures are supported by a combination of gum tissues and natural teeth. Although removable dentures are very common, most denture wearers find removable dentures uncomfortable, difficult to live with and would prefer a fixed alternative. Unlike natural teeth dentures move while eating and sometimes during speech. 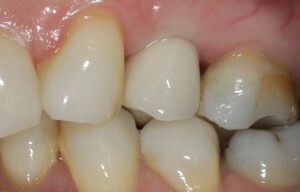 Dental bridges are supported and joined to natural teeth. 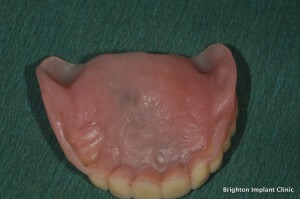 Unlike removable dentures, dental bridges are fixed, comfortable and secure. 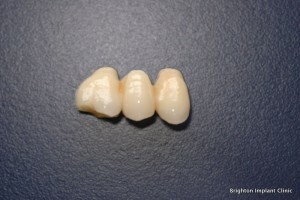 Dental bridges are more comfortable than removable dentures as they feel and function like natural teeth. However there are disadvantages to fixed bridges. The adjacent teeth are prepared in order to support the bridge, and this requires the removal/reduction of a uniform thickness of tooth. This reduction in tooth material removes the protective layer of enamel and can lead to future problems. In some instances it was shown that 50% of teeth prepared for bridge work required root canal treatment within 3 years after tooth preparation. Dental Implants are small titanium screws that are placed into the jaw bone to replace Single Missing Teeth or Multiple Missing Teeth. Bone tissue has an affinity for titanium and over time will fuse with the titanium surface. This process is called osseo-integration. Implants have been a predictable and viable option for replacing missing teeth for more than 30 years and dental professionals consider it the most effective treatment for missing teeth. For further information on the benefits of dental implants, click on the link to the ADI website. Dental implants look, feel and the function like healthy natural teeth. The overall look improves confidence and gives one a natural smile. They feel just like natural teeth, removing the fears associated with dentures falling out or slipping. Dental implants are fixed into position so there is no movement when eating or talking and speech is not affected (the way it can be with dentures). The benefits of dental implants is that they function just like natural teeth and are maintained in the same way. Other benefits of dental implants include: prevention of bone loss in the jaw, ability to chew tougher or crunchy foods, the treatment is quick with minimal pain, the results are longer lasting than other tooth replacement treatments. Dental implants are especially suitable for patients who are unable to cope with uncomfortable or moving dentures. Before Dental Implant Treatment can be carried out a thorough analysis of the mouth needs to be completed. The quality and volume of bone is evaluated using radio-graphs and 3D imaging. Dental implants come in many different shapes and sizes and your implant surgeon will assess which implant is best suited for your mouth. If there is insufficient bone, grafting procedures may be able to increase the volume of bone in order to correct the bone deficiency. Benefits of dental implants – How long does treatment take? 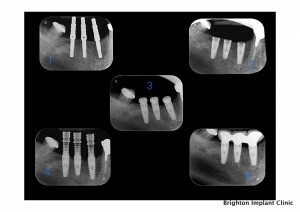 Treatment time can vary widely, however most implant treatments require 6-9 months to be completed. Those treatments that require bone grafting will need longer healing times and will take longer to complete. It is recommended that patients obtain a detailed written treatment plan at the start of the process. The implant surgeon should not only discuss the benefits of dental implants but also the risks and possible complications prior to starting treatment. 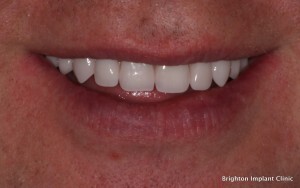 Brighton implant clinic specializes in dental implant treatment. We provide a free consultation and provide all patients with a detailed information on the Benefits of Dental Implants please feel free to Contact Brighton Implant Clinic or Call us on 0800 111 6623.